Objectives: To evaluate the color change in teeth bleached with two different concentrations of hydrogen peroxide, containing sweet potato extract as an additive, using a spectrophotometer, and to evaluate the surface changes in enamel using a scanning electron microscope (SEM). Materials and Methods: Baseline color values of 24 artificially stained incisors were obtained using a spectrophotometer. The specimens were divided into two groups of 12 teeth, each based on the concentration of hydrogen peroxide (H 2 O 2 ) as follows: Group I - 35% H 2 O 2 and Group II - 10% H 2 O 2 . One-half of the tooth was bleached with H 2 O 2 alone (Subgroup A) and the other half was bleached with a combination of H 2 O 2 and sweet potato extract (Subgroup B). Post bleaching the Commission Internationale de l' Eclairage L*, a*, b* (CIEL*a*b*) values were obtained and ΔE was calculated. The surfaces of the samples were examined using SEM. Results: The mean ΔE values of groups IB (72.52 ± 2.03) and IIB (71.50 ± 1.81) were significantly higher than those of groups IA (65.24 ± 1.02) and IIA (64.19 ± 1.88), respectively, (P < 0.05). The SEM images of groups IB and IIB showed lesser surface irregularities and morphological alterations in enamel. Conclusion: The addition of sweet potato extract to hydrogen peroxide not only resulted in the restoration of the natural tooth color, but also decreased the effects of bleaching on the enamel morphology, compared to the use of hydrogen peroxide alone. The present study aims at providing a tooth bleaching formulation containing vegetative enzyme extract obtained from plant tubers. Sweet potato (Ipomoea batatas L) is one such plant tuber, which has a high content of enzymes such as polyphenol peroxidase (PO), catalase (CAT), and superoxide dismutase (SOD). Hence, the aim of this in vitro study is to evaluate the color change in teeth bleached with two different concentrations of hydrogen peroxide, using sweet potato extract as an additive, with the help of a spectrophotometer, and furthermore, to evaluate the surface changes in the enamel post bleaching, using a scanning electron microscope (SEM). Two hundred grams of sweet potato, with purple color flesh, were cleaned, peeled, and cut into cubes. The cubes were smashed to a concentrate with 25 ml of deionized water in a blender and the concentrate was filtered out. One hundred milliliters of the filtered sweet potato concentrate was centrifuged at 2000 rpm for two minutes at a temperature of 4°C. The clear liquid thus collected is the sweet potato extract. This extract was refrigerated at 4°C until use. Twenty-four maxillary central incisor teeth, extracted due to periodontal disease, and free of visible cracks, caries, defects, or decalcification were collected for the study. The teeth were cleaned of calculus and the remaining soft tissue using an ultrasonic scaler (Satelec/Acteon Suprasson Newtron Ultrasonic Scaler, New Jersey, USA). The teeth were stored in 0.2% thymol and refrigerated under 4°C until use. Artificial staining of the teeth as established by Suleiman M et al., was followed in this study. A tea bag (2 g) (Ranfer Tea, Colombo, Sri Lanka) was suspended in 100 ml of boiling deionized water for five minutes, and the solution was cooled to room temperature. The solution was strained and the clear tea solution was used for staining. The teeth were then immersed in tea solution for 24 hours. After 24 hours, the teeth were washed and stored under 100% humidity at 37°C, until use. The baseline color values of the specimens were measured over a white background using a reflectance spectrophotometer (X-Rite Gretag Macbeth, Berlin, Germany), which recorded the color variables L*, a*, b* according to the CIEL*a*b* color system. Group IA: (n = 12) 35% hydrogen peroxide solution. Group IB: (n = 12) 1 ml of sweet potato extract was blended with 28 ml of (100 mM) phosphate buffered saline (PBS) and 1 ml of 35% (1M) hydrogen peroxide to prepare a solution of 30 ml. Group IIA: (n = 12) 10% hydrogen peroxide solution. Group IIB: (n = 12) 1 ml of sweet potato extract was blended with 28 ml of PBS (100 mM) and 1 ml of 10% hydrogen peroxide (1M) to prepare a solution of 30 ml. The specimens in each subgroup were covered with a piece of gauze, saturated with 3 ml of the experimental solution, for a period of 30 minutes, with the bleaching agent being changed every 10 minutes. This bleaching procedure was repeated twice, with a one-week interval, during which time the specimens were stored in artificial saliva at 37°C. After carrying out the bleaching protocols, the teeth were rinsed and stored in artificial saliva at 37°C for 24 hours. The color of the bleached specimens were then measured over a white background employing a spectrophotometer, which recorded the color variables L*, a*, b* according to the CIEL*a*b* color system. The color change before and after bleaching was taken as an index to evaluate the whiteness after bleaching. Data pertaining to color change was analyzed using the student's t test at a 5% significance level. To evaluate the effect of bleaching solutions on the surface morphology of enamel, all the samples were subjected to scanning electron microscopic analysis (SEM JEOL model, JSE-5610 LV). The specimens were vacuum desiccated first in alcohol and subsequently in acetone, followed by sputter-coating with gold. Micrographs were taken at a magnification of 2000x. The entire exposed labial surface was scanned and the most critical areas were selected for SEM photomicrographs. The results of this in vitro study are given in [Table 1]. There was no significant difference between the mean ΔE values of group IA (35% H 2 O 2 - 65.24 ± 1.02) and group IIA (10% H 2 O 2 - 64.19 ± 1.88) (P > 0.05). The mean ΔE values of group IB (35% H 2 O 2 + sweet potato extract - 72.52 ± 2.03) and group IIB (10%H 2 O 2 + sweet potato extract - 71.50 ± 1.81) were significantly higher compared to their respective baseline values (P < 0.001). The mean ΔE values of groups IB and IIB were significantly higher than those of groups IA (35% H 2 O 2 - 65.24 ± 1.02) and IIA (10% H 2 O 2 - 64.19 ± 1.88), respectively, (P < 0.05). There was no statistically significant difference between the mean ΔE values of groups IB and group IIB (P > 0.05). The SEM micrographs of group IA [Figure 1]a and group IIA [Figure 1]c showed a roughened enamel surface, with loss of aprismatic enamel. A presence of cracks and craters was also evident. The SEM micrographs of group IB [Figure 1]b and group IIB [Figure 1]d showed a lesser number of morphological surface irregularities, with an absence of cracks and craters. Hydrogen peroxide readily decomposes when it encounters substances with which it can react and results in the release of free radicals. If the bleaching procedure is continued beyond the saturation point, in the course of decomposition, hydrogen peroxide also interacts with the organic components of the tooth, such as proteins and lipids, resulting in their removal. This makes the surface rough. Hydrogen peroxide also dissolves the inorganic components of enamel by penetrating the intra- and interprismatic regions. An increased exposure to hydrogen peroxide leads to an increase in its penetration into the enamel. This leads to a deepening of the grooves in an already roughened enamel surface. , Hence, this in vitro study aims at achieving high efficiency dental bleaching, with less or no deleterious effects on the enamel surface. In the present study, the CIE L*a*b* values were used to assess the color change of the bleached enamel. In 1976, CIE recommended the CIE L*a*b* color scale for use. This scale defined the color more closely to human perception, and thus, provided a standard scale for comparison of color values. , A spectrophotometer was selected for the study over a calorimeter, as the latter was designed to measure the color of flat surfaces of objects rather than tooth surfaces, which were not usually flat. Also the inter-instrument repeatability with a calorimeter was comparatively poor when compared with intra-instrument repeatability. Okubo et al., (1998)  and Tung et al., (2002)  inferred that the colors assessed by the colorimeter and the shade guides were inconsistent. On the other hand, the spectrophotometer not only demonstrated high accuracy and reproducibility similar to the colorimeter,  it even performed better than the shade guide assessment. The results of this in vitro study indicated that there was no significant difference in the mean ΔE values of group IA and group IIA. Leonard et al., in 1998, and Matis et al., in 2000, showed that lower concentrations of carbamide peroxide achieved the same result in whitening teeth, as compared to the higher concentrations, when shade assessment was done after a period of two to six weeks. When catalase is added to hydrogen peroxide in specific concentrations, the enzyme catalase combines temporarily with the hydrogen peroxide molecule forming a catalase-hydrogen peroxide complex. This combination places added stress on the intermolecular bonds holding the substrate molecules together, thereby lowering the activation energy (21 kJ/mol) needed to initiate the chemical reaction. Owing to this, large quantities of free radicals of hydrogen peroxide are released within a shorter period of time. , This in turn reduces the time the bleaching agent is in contact with the tooth, and thus, lessens the possibility of creating grooves or micropores across the surface of the bleached enamel. The effectiveness of bleaching is directly related to exposure time and concentration of the active ingredient. With an increase in the exposure time and concentration, the oxidative process becomes stronger, and hence, the resultant complications become greater - the most common being weakening of the enamel. , This has been demonstrated in the SEM micrographs of the present study. 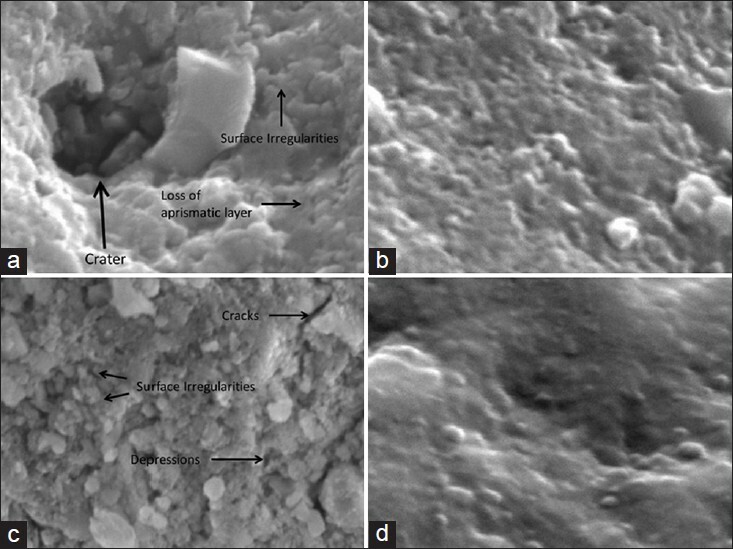 The SEM micrographs of group IB [Figure 1]b and group IIB [Figure 1]d show lesser number of surface irregularities, with absence of cracks and craters, when compared to group IA [Figure 1]a and group IIA [Figure 1]c. The lesser enamel surface changes in groups IB and IIB may be attributed to the presence of enzymatic and non-enzymatic antioxidants in sweet potato, which exert a scavenging action on free radicals, thus limiting their deleterious effects on the enamel. Achieving a smooth enamel surface post bleaching reduces the possibility of stain or pigment deposition within a certain period of time, after bleaching, and the addition of sweet potato extract to hydrogen peroxide enables one to achieve the same. Under the limitations of this in vitro study, it can be concluded that the use of hydrogen peroxide (both 35 and 10%) containing sweet potato extract, as a bleaching agent, not only results in the restoration of natural tooth color, but also decreases the effects of bleaching on the enamel morphology, compared to the use of hydrogen peroxide alone. 1. Swift EJ Jr. Restorative considerations with vital tooth bleaching. J Am Dent Assoc 1997;128:60S-4S. 2. Haywood VB, Berry TG. Natural tooth bleaching. In: Summit JB, Robbins JW, Hilton TJ, Schwartz RS, Dos Santos J Jr. Fundamentals of Operative Dentistry-A Contemporary Approach. 3 rd ed. Illinois: Quintessence Publishing Co, Inc; 2006. p. 437-62. 3. Miranda CB, Pagani C, Benetti AR, Matuda FS. Evaluation of the bleached human enamel by scanning electron microscopy. J Appl Oral Sci 2005;13:204-11. 4. Bitter NC. A scanning electron microscope study of the long term effect of bleaching agents on the enamel surface in vivo. Gen Dent 1998;46:84-8. 5. Hegedus C, Bistey T, Flora-Nagy E, Keszthelyi G, Jenei A. An atomic force microscopy study on the effect of bleaching agents on enamel surface. J Dent 1999;27:509-15. 6. Ernst CP, Marroquin BB, Willershausen-Zonnchen B. Effects of hydrogrn peroxide-containing bleaching agents on the morphology of human enamel. Quintessence Int 1996;27:53-6. 7. Rotstein I. Role of catalase in the elimination of residual hydrogen peroxide following tooth bleaching. J Endod 1993;19:567-9. 8. Spychalla JP, Desborough SL. Superoxide dismutase, catalase and α-tocopherol content of stored potato tubers. Plant Physiol 1990;94:1214-8. 9. Teow CC, Truong VD, McFeeters RF, Thompson RL, Pecota KV, Yencho GC. Antioxidant activities, phenolic and β-carotene contents of sweet potato genotypes with varying flesh colors. Food chem 2007;103:829-38. 10. Sulieman M, Addy M, Macdonald E, Rees JS. The bleaching depth of 35% hydrogen peroxide based in-office product: A study in vivo. J Dent 2005;33:33-40. 11. Delfino CS, Chinelatti MA, Carrasco-Guerisoli LD, Batista AR, Froner IC, Palma-Dibb RG. Effectiveness of home bleaching agents in discolored teeth and influence on enamel microhardness. J Appl Oral Sci 2009;17:284-8. 12. Lopes GC, Bonissoni L, Baratieri LN, Vieira LC, Monteiro S Jr. Effect of bleaching agents on the hardness and morphology of enamel. J Esthet Restor Dent 2002;14:24-30. 13. Heim KE, Tagliaferro AR, Bobilya DJ. Flavonoid antioxidants: Chemistry, metabolism and structure-activity relationships. J Nutr Biochem 2002;13:572-84. 14. Knosel M, Attin R, Becker K, Attin T. A randomized CIE L*a*b* evaluation of external bleaching therapy effects on fluorotic enamel stains. Quintessence Int 2008;39:391-9. 15. Joiner A. Tooth colour: A review of the literature. J Dent 2004;32:3-12. 16. Douglas RD. Precision of in vivo colorimetric assessments of teeth. J Prosthet Dent 1977;77:464-70. 17. Okubo SR, Kanawati A, Richards MW, Childress S. Evaluation of visual and instrument shade matching. J Prosthet Dent 1998;80:642-8. 18. Tung FF, Goldstein GR, Jang S, Hittelman E. The repeatability of an intraoral dental calorimeter. J Prosthet Dent 2002;88:585-90. 19. Goldstein GR, Schmitt GW. Repeatability of a specially designed intraoral colorimeter. J Prosthet Dent 1993;69:616-9. 20. Paul S, Peter A, Pietroban N, Hammerie CHF. Visual and spectrophotometric shade analysis of human teeth. J Dent Res 2002;81:578-82. 21. Leonard RH, Sharma A, Haywood VB. Use of different concentrations of carbamide peroxide for bleaching teeth: An in vitro study. Quintessence Int 1998;29:503-7. 22. Matis BA, Mousa HN, Cochran MA, Eckert GJ. Clinical evaluation of bleaching agents of different concentrations. Quintessence Int 2000;3:303-10. 23. Martin Rowland. Energy and enzymes. In: Biology, 1 st ed. Walton-on-Thames Surrey, UK: Thomas Nelson and Sons Ltd; 1992. p. 107. 24. Braun A, Jepsen S, Krause F. Spectrophotometric and visual evaluation of vital tooth bleaching employing different carbamide peroxide concentrations. Dent Mater 2007;23:165-9.